A once-anonymous abstract painting owned by Laurie Pike was recently determined to be the work of legendary hard-edge painter Frederick Hammersley. 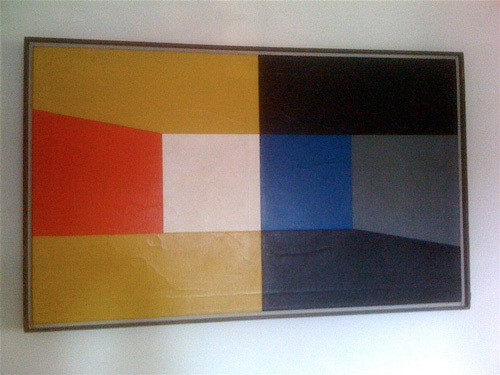 The “found” Hammersley painting is titled One Pair and is dated 1960. 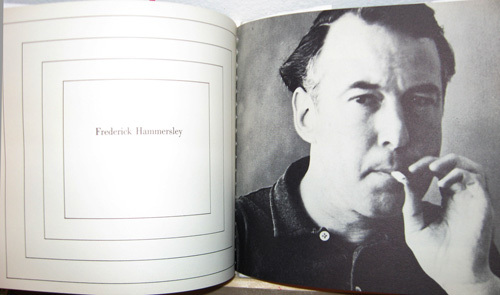 Frederick Hammersley is one of my favorite painters, and I’ve written about him considerably. With Ms. Pike’s consent, I would like to share the story of the found painting with you. Ms. Pike has consulted with LA Louver Gallery about restoring — and potentially selling — the Hammersley painting. 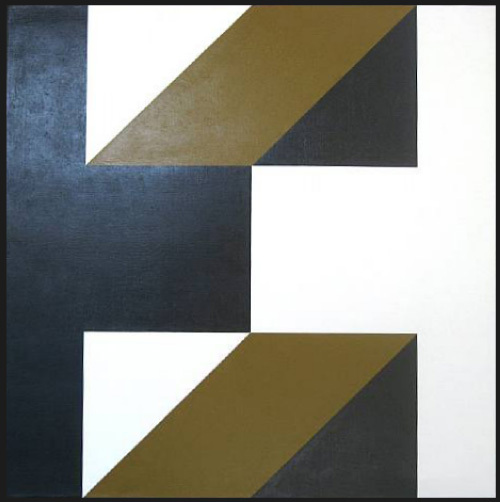 This afternoon, I became profoundly saddened when I learned that Frederick Hammersley, one of my favorite painters, passed away on Sunday, at the age of 90. An email newsletter from Charlotte Jackson Fine Art revealed the news. The subject line read Frederick Hammersley (1919-2009). Before I clicked to open the email, fearing the worst, I tried to trick myself into thinking that perhaps he would be having a new retrospective exhibition. To my disbelief, I was wrong. 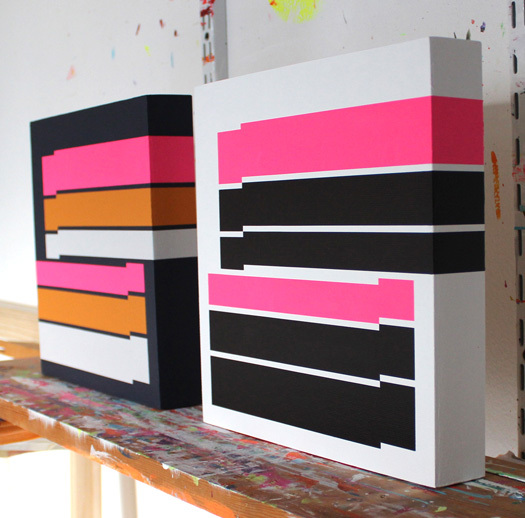 I would like to tell you why Frederick Hammersley’s work is so important to me. And I would like to explain my sadness for never writing him a letter, telling him how highly I think of his work, and how much I appreciate how he was able to pursue two very different styles of painting throughout his life (“geometries” and “organics”). However, the reason why Hammersley doesn’t have a larger following, in my opinion, is a simple question of geography. Because they were based in Southern California, Hammersley, Karl Benjamin and other members of the Hard Edge abstraction group were thousands of miles away from New York, in a literal and figurative sense. While the West Coast Hard Edge painters were doing some truly astonishing, adventurous, highly original work, they didn’t fit the prevailing “discourse” of New York at the time. When the term “hard edge art” took shape in LA in 1959, pop art was right around the corner in New York; hard edge didn’t have a place in New York’s visual agenda. “It was so brand-new,” Hammersley said, recounting how his paintings were received in 1959. “I assumed people couldn’t relate to it,” he says. Despite not receiving the critical or curatorial attention he deserved, Hammersley carried on, painting away—way off the radar in Albuquerque—following his intuition, one painting at a time. Yet, now, with hindsight—and thanks to Dave Hickey (who curated Site Santa Fe in 2001), Charlotte Jackson Fine Art (Hammersley’s gallery), Art Santa Fe (which will soon release a retrospective book of Hammersley’s works), and Elizabeth Armstrong (curator of the recent Birth of the Cool exhibition)—Hammersley’s profile certainly will increase. I first encountered Hammersley’s work at Charlotte Jackson in July 2006, at the opening of his Hard Edge show, which blew my mind. Anyway, three years ago, Hammersley’s show was exactly what I needed to see. I was in a point of transition, artistically, from painting neo-pop art to my own idea of minimal art. I was experiencing a lot of doubts about my decision, and I could tell I was leaving behind an audience in the process. I felt compelled to keep painting trippy pop paintings—because that’s what people said they liked—but I wanted to do something completely different. After seeing Mr. Hammersley’s paintings in person, I felt like I had turned a corner—I had found a new artistic role model, if you will. He replaced Andy Warhol in my mind. It was “cool” to paint completely nonobjective work with just a couple of shapes in it. The show not only validated my own intuition, as a matter of fact, as I was leaving Charlotte Jackson, I literally turned around one last time and pumped my fist in the air. My reaction was that intense. I drove back to Phoenix beaming. Following the Hard Edge show, I felt truly inspired to write Mr. Hammersley a letter. But somehow, I second-guessed the idea, as if it was too much of a stretch. I regret that decision. But I am thankful to say that I was able to see the Birth of the Cool exhibition at the Blanton Museum of Art in Austin, Texas, two weeks before the touring show closed for good. While I swooned over Karl Benjamin’s loud-as-hell color combinations, Hammersley’s mid-1960s painting Come, really resonated with me. I can’t find an image of it online, so I must ask you to imagine four circles (as I remember, three are white, one black), arranged in the center of a cornflower blue rectangle, in a diamond configuration. The black circle is at the bottom. Yet, it’s not the circles, themselves, that do the talking, it’s the negative space between them. Genius. We have lost a truly great painter—one of the greatest artists of our time. I know I am not alone in my sorrow. But I am comforted by the idea that so many artists and curators will be inspired by Hammersley’s work, and by his example, far into the future. Thanks to a very smart and astute friend of mine, who sent me this post by Tyler Green, I was really happy to learn today that the Albright-Knox Gallery in Buffalo recently acquired a painting by Frederick Hammersley, one of my heroes of painting. I think the Albright-Knox got it totally right, and Mr. Green is completely correct for urging for “some smart curator” to “organize a thorough revisionist hard-edge painting survey.” I’d love to see it. And I’d also like to see a massive book that documents hard-edge abstraction from John McLaughlin onward. Books on hard-edge painting aren’t exactly numerous. I think my mind is still blown just thinking of seeing Hammersley’s Hard Edge solo show in Santa Fe three years ago, at Charlotte Jackson. I stood before Hammersley’s with breath taken away by Come Grow. His work was relentlessly original 40-plus years ago and it’s still fresh to this day. And my head still spins by Hammersley’s Even #3 (below), a 2007 addition to Phoenix Art Museum’s collection. In spite of its modest size (40 x 30 inches), it can command a massive wall. This evening I was fortunate to catch Chuck Jones short animated film from 1965 The Dot and the Line: A Romance in Lower Mathematics, which you can see for yourself on YouTube. Aside from Jones’s mesmerizing animation, I completely identified with the line’s quest to somehow reinvent himself into something new, completely contrary to the antics of the scruffy, fun-loving and “cool” squiggle. And I was reminded, ever so gently, that lines and shapes can be transformed in infinite ways, if only you try to bend your brain accordingly. The Dot and the Line embodies the story of artistic struggle; the triumph of self-discipline over hedonistic whim; and the classic, universal beauty of geometry. The analogy can be extended to Mods vs. Rockers (in The Who’s Quadrophenia) and neo-hard-edge/neo-minimalism vs. lowbrow. The Dot and the Line is the perfect film to watch when faced with a compositional stalling point. It’s also a moving tribute to having faith in one’s ability and power to make something beautiful. What do Frederick Hammersley and Chuck Jones have in common? 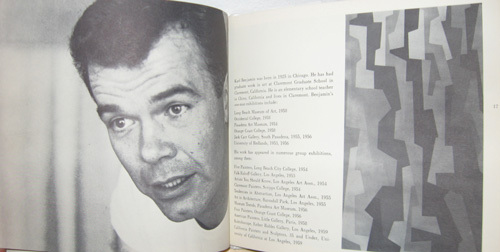 Chouinard Art Institute, a predecessor of CalArts. Hammersley attended the school in the early 1940s, and taught there from 1964 to 1968; Jones attended Chouinard in the late 1920s. Wish I could have attended Chouinard, too! But I’m a self-taught artist. My technique was really quite poor for a long time. I just kept at it, though. Technically, I’m still not great. I’m more motivated to get ideas out, rather than obsess over surfaces. After all, perfection is just an idea. We never attain it, no matter how hard we try. Creation is a process. 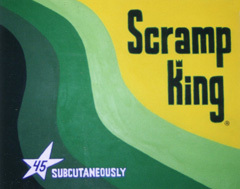 A progression: At left, Scramp King, the first painting I painted, in 1994. At right, my most recent maximalist art work. Q. Why hard edge? 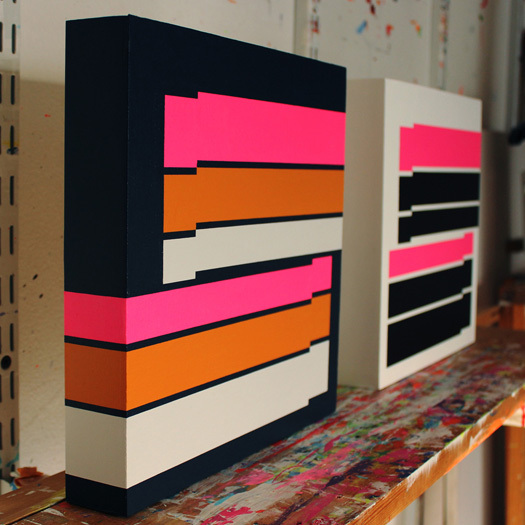 My interest in hard-edge painting stems from Jo Baer and Frederick Hammersley. I first came across Baer’s work in the catalog for the SITE Santa Fe Biennial of 2001, curated by Dave Hickey, a critic I really admire. Hammersley was in that show, too, but I didn’t really get the “point” of his work until I saw it in Santa Fe a couple of years ago, at Charlotte Jackson Fine Art. Seeing Hammersley’s work left a lasting impact on me. His work justified, for lack of a better term, my “switch” to painting with a more minimalist style. Plus, he was a pioneer of hard-edge painting, back in 1959. 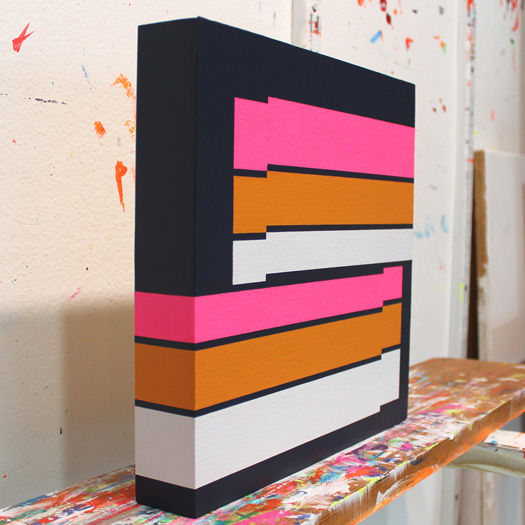 I call my minimal work hard-edge because the edges are clean, but I also believe in carrying on that tradition, even though the term “hard-edge painting” meant something totally different back then. Mind you, hard edge is one half of my work. The other half is what I call “maximalist.” It’s a descendant of my early “acid pop” work (from 1993 onward). I think it’s really what I’m all about. I started to explore minimalist painting in 2003, just before I saw that SITE Santa Fe catalogue. 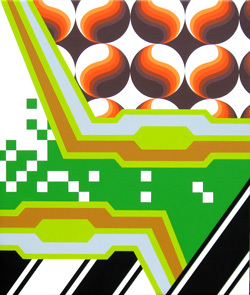 I was losing interest in painting in a neo-pop art style, which was my original direction. When the Iraq war started, I started to feel really uncomfortable with irony—spoofing corporate logos. That was a 90’s thing, anyway. I decided I wanted to make something beautiful instead. So, for about five years, until earlier this year, I couldn’t make up my mind about whether I was to be a minimalist (giving up on my earlier work) or a maximalist (continuing the “acid pop” line of thought). It was a difficult five years. I realized it’s okay to go back and forth between the two styles; they form a complete whole. I thought I had to choose between the two, but that’s not the case. Q. Who are your major influences? Beyond Baer and Hammersley, I’d say Warhol was my first big influence. He had a Dadaist sensibility, and I was really into Dadaist poetry when I was in school. I loved the way he deflated mass media. For a long time, it was Warhol, Warhol and more Warhol. Otherwise, artists I really admire include Eduardo Paolozzi (his work is amazing! 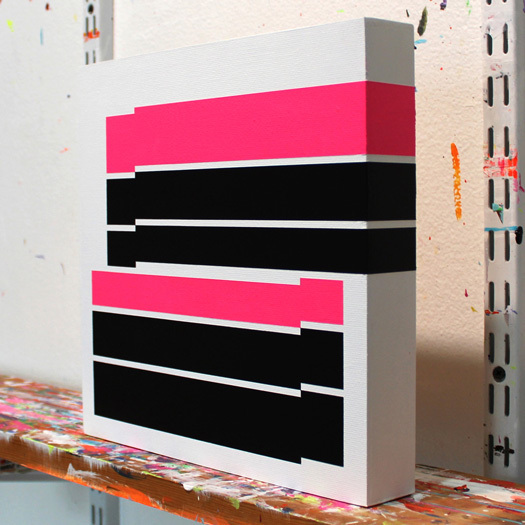 ), Bridget Riley, Julian Stanczak, Stephane Dafflon and early Sarah Morris. And Oliver Hibert, a great artist friend of mine. We’ve been going against the grain, out here in middle-of-nowhere Arizona, for years. Ultimately, I’m not really inspired by other painters. And I don’t really pay much attention to the “art world,” which seems to be more and more about all of things that art isn’t about. I get more inspiration from semi trucks, vintage wallpaper and fabrics, football (soccer) jerseys, corporate logos and fashion. I just kind of jam all of those influences together in my maximalist work. How do you make your paintings? I do everything on the computer first. My work isn’t really conducive to improvisation. So I spend a lot of time “versioning things out” on screen first. Sometimes I’ll design something and it will sit there for months, even years, before I go back to it. Also, I mix my colors to printouts. I want to know exactly what I’m going to do before I jump into making a painting.